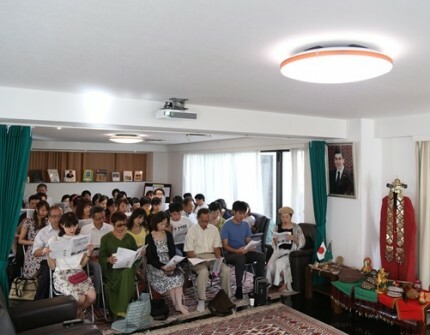 On September 10, 2018, a presentation dedicated to the 27th anniversary of Independence of Turkmenistan and the start of «Amul –Khazar 2018» international rally for media and NGOs representatives was organized in the Embassy of Turkmenistan in Japan. The Embassy staff presented to the audience the latest achievements in Turkmenistan and the President’s initiatives for the sake of all mankind during the conference. Moreover, the role of international rally running from Amul to Khazar in promoting Turkmen initiatives and projects in transport sector, popularizing its regional and global significance was underlined. These initiatives also make nations and states get closer, enhance trade, economic and humanitarian relations and create conditions for inclusive growth. The speakers from Japan emphasized that, they have welcomed foreign policy pursued by Turkmenistan and «Amul –Khazar 2018» international rally would leave positive impressions in the international level. At the end of event the participants were served dishes of Turkmen traditional cuisine.